Backyard Summer Nature in New Jersey. 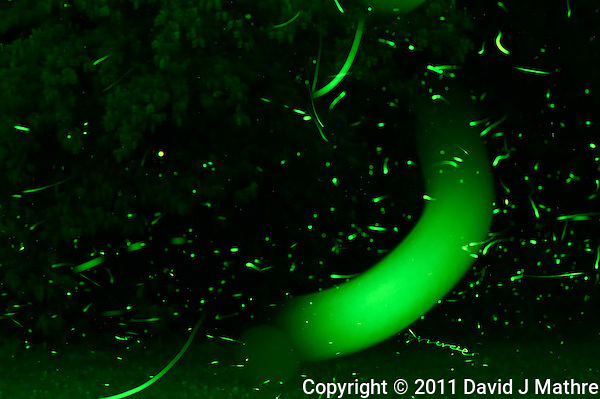 Another composite image of fireflies in my backyard. This time with a telephoto lens at f/13 to try to get a deeper depth of field effect. As before, the camera was set up to take 25 second images, and the resultant 110 images combined using the Startrails program. Backyard Fireflies. Early Summer in New Jersey. Image taken with a Nikon D3s and 600 mm f/4 lens (ISO 2500, 600 mm, f/13, 25 sec). Images processed with Capture One Pro, Startrails (used to stack 110 images), and Photoshop CS5. Thanks for the question. I hadn’t really thought about it, so found a reference that “Dark-active North American fireflies emit green bioluminescence and dusk-active species emit yellow.” in the linked scientific paper Ecology of Colors of Firefly Bioluminescence . This set of images was from later at night so I would have a nearly black background. I’ll have to try it again at dusk to see if I can detect a more yellow color. The hard part will deciding on the best white balance.